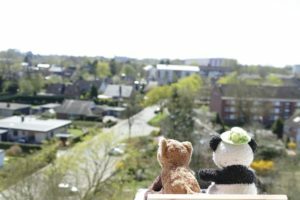  » You&apos;re currently reading "Presentation of the two pandas that run this blog"
I, Ronnie, am a red or Little Panda and arrived at 20.08.2014 in my current family. This is a nice young couple who took the first holiday together. They visited the zoo Blijdorp in Rotterdam on the day mentioned. It was a beautiful summer day and I had a monotonous existence in the zoo’s shop with my brothers and sisters, when the said couple entered the shop as the crowning conclusion of their zoo. Shortly thereafter they were standing right in front of our shelf and were quite enchanted. Now the question remained, which of the red pandas would take them with them. It was a fact that they wanted to take one of us. When my present wife grabbed me, I could hardly believe my happiness. But unfortunately, the illusion burst abruptly. For my present master found that my nose would be too wrong! 😯 And then attacked one of my siblings. But my mistress had already locked me in my heart and said that I would be something special, and so she bought me. Since then I spend beautiful days with you and am very happy! Even happier I could not actually be until my beloved Ana showed up. She’s been a few years older than me, but that doesn’t bother me. Unfortunately, she has not had such a beautiful life… They zentrale randlage their existence between all other animals in a dark and narrow closet. 😥 Until missus discovered it in a cleanup. Of course she immediately liberated Ana from her sad situation and gave her a new life in our family. At first she was still very shy and still, but that lay fast. And one day we fell in love and are now a couple of bears.